Opportunity to invest in income-producing development land that is appreciating in value daily. 136 acres along northbound I-35. Approximately 80 acres inside city limits, remaining acreage is outside city limits. 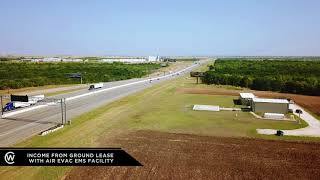 Approximately 4000 ft of I-35 frontage and over 2400 ft of county road frontage. The property lends itself to numerous types of development. Infrastructure includes 6" water line extension (engineered) with additional taps, fire hydrants and road bores in place. 1100 ft of all season road in place and ready for additional development. Property is currently generating lease income from 80 acres of cultivated ground and 3 billboards along I-35, as well as a ground lease for an Air Evac EMS facility.